Welcome to a brand newguest recipe… from Lottie!!!!! 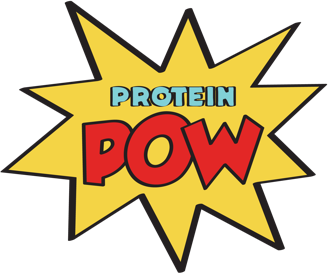 We connected with Lottie at a Protein Pow workshop last month and I suggest you connect with her too because she’s not only a wonderful person, she’s always full of great recipe ideas! Here’s her Instagram account and here’s her site. Go on and follow her. She’s really fun, happy, positive, and full of great advice on all things nutrition, fitness, and fun 🙂 Say hi and you’ll see what I mean! Side note: Our next London workshop is going to be next month! There’s not a lot of tickets left so if you want to join, head over here to grab one. Pre-heat your hot box to 180C and line a cupcake tray with 8 cupcake cases. I spray my cases with low-calorie cooking spray so the muffins come out easy. Tip all the dry ingredients in a large bowl and mix until combined. In a separate bowl, roughly mash your banana (lumpy banana makes the best batter and the best batter makes the best muffins. That’s science.) Throw in your egg, almond milk and vanilla extract and whisk together. Pour the wet ingredients into the dry, and fold together until evenly incorporated. Spoon into your waiting cupcake cases and bake for 10-12 minutes. Macros per serving: 69kcals, 5g protein, 8g carbs, 2g fat and 2g fiber!